Think big with the 2018 Ram 1500. This modern pickup truck is ready to handle tough projects and keep you comfortable with a richly-appointed cabin. Not to mention all of the modern technology it offers for safety and entertainment. To understand how the Ram 1500 can change the way you work, come to your local Ram dealer, Bill Estes Chrysler Dodge Jeep Ram! From the rugged Tradesman to the off-road ready Rebel, there is a trim level of the Ram 1500 to match your lifestyle. Go with the regular cab if your main focus is hauling gear, or the Crew Cab if you like to bring friends and family along for the ride. You can even opt for the Quad Cab, which features hinged doors that allow you to load and unload with ease. With bed lengths ranging from six feet to eight feet, the choice is truly up to you! Regardless of which combination or trim level you decide on, the Ram 1500 is ready for work. Built with a high-strength steel safety frame, hydroformed tubular front frame unit, and eight ultra-tough crossmembers, there’s almost no situation this truck can’t handle. When it comes to safety, the Ram 1500 has your back with side-impact door beams and dynamic front crumple zones. To avoid a collision from even happening in the first place, you’ll have electronic stability control and 4-wheel disc anti-lock brakes standard. For advanced assistance, the available ParkSense® Front Park Assist System1 and ParkView® Rear Back Up Camera2 uses several cameras and radar technology to keep you aware of your surroundings. In terms of capability, the Ram 1500 is nothing short of impressive. The engine lineup includes two gas and one diesel fuel option, all of which have their own benefits. The 3.6L Pentastar® V6 engine, for example, gives you a balance of performance and efficiency with 305-hp, 269 lb-ft. of torque, and 17/25 MPG city/hwy3. For an increase of brawn, the 5.7L HEMI® V8 engine achieves 395-hp and 410 lb.-ft. of torque. Last, but certainly not least, is the 3.0L EcoDiesel V6 engine that has reduced CO2 emissions while cranking out 240-hp and 420 lb.-ft. of torque. You’ll be in control with the smooth shifting of the Torqueflite® 8-speed automatic transmission that includes an instrument panel-mounted Rotary E-shift. Topping out at a 10,620-lb. maximum gas towing capacity4 and a 1,880-lb. maximum gas payload capacity4, you’ll be able to say yes to all kind of projects. Ready to experience the 2018 Ram 1500 for sale in Brownsburg, IN, up close and in person? 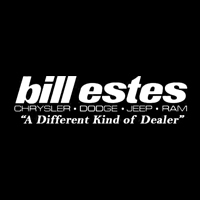 Visit us at Bill Estes Chrysler Dodge Jeep Ram and take it for a test drive!